Robert Ollis provided musical direction for all vocal parts. 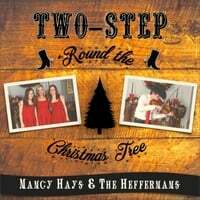 Two-Step 'Round the Christmas Tree was recorded by Nancy and her family in Chicago and Nasvhille and produced by Nashville based, Randy Gardner who has worked with Nancy Hays on many other recordings in the past including her most popular song "Come Dance with Me". Choreographers Joe Thompson Szymanski and Norm Gifford's line dance "Just a Two Steppin'" or the classic line dance "Cowboy Charleston" work well with the song, as does traditional two step couples dancing. Happy holidays and happy dancing!